Children will often play in their beds rather than going to sleep. They talk, they play. My nearly three year old has recently decided his bed is a train that he loves to drive. Imagination is a whole new ballgame. You can control toys in the bed, but all things imaginary are controlled by your child. So what do you do in that situation? My method for handling this has actually been pretty much the same for both kids. This is surprising because I have had to do things pretty differently with each for most situations. First, I wait to see if they will just go to sleep on their own. I give them about 10-15 minutes to go to sleep. If they don’t go to sleep in that time period, I go in, lay them down, and tell them firmly that it is time to go to sleep. We can play after the nap, but right now it is time to sleep. That honestly usually solves it. If you child is accustomed to following your voice commands, this should solve the problem. With a baby, there is a good chance they will cry for a minute or two after you leave. A toddler knows what he should be doing and will likely concede and go to sleep. If not, repeat the first two steps. I also practice this method if the child wakes early from a nap. I grew up with horses, and the phrase, “You can lead a horse to water, but you can’t make him drink” is so true. You can force the head into the water bucket, and still no drinking unless the horse wants to. I believe this is true with children and sleep. You create the environment, you direct them, but ultimately they will only sleep if they want to. You can have rules and expectations. Rules would be that they must be in bed and they must down. You expect that they will take a nap. In the end, sleep will come when they let it. Try to not stress if one nap goes bad every so often. It happens. Both my friend and I have noticed that our sons tend to skip about one nap a week, especially when the weather doesn’t allow for running around outside. You can do an early bed time if that happens. Try to take things in stride. I understand the stressing; I have been there. But naps will be disrupted. It is bound to happen. Move on and do what you can to prevent it from happening often. I’ve been following BW for awhile but mainly focusing on nightime sleep. Yesterday and today I’ve been working on naps. It turns out my daughter (11 weeks) can only be up for 1 hr – 1hr 10 min., If I put here down after 1 hr. awaketime she goes right to sleep (it’s amazing how well BW works).My only issue is – when do you do any errands?!!! I feel like I can’t leave the house. 20 minutes of her wake time is spent nursing then I feel bad just strapping her in the car after sleeping for so long, plus that doesn’t give me time to do really anything. Also she sleeps 11 hours at night with 1 middle of the night feeding.Is she sleeping too much? What a relief it has been to find your blog on babywise! My third child was “babywised” and it went so smoothly (or that’s how I remember it, anyways)and my fourth child is 6 weeks now and I feel like I’m struggling and ready to give up. However, I’ve been reading through your blog all morning and I’ve found some wonderful ideas and suggestions that I’m going to try! It’s given me a well-needed boost. Thanks for sharing all your knowledge with the rest of us!! I appreciate it so much!!! Thank you Megan and plowmanators. Fortunately so far he hasn’t been doing it at night. We’ll see how today’s naps go. Thanks again, though, really helpful stuff! I am so glad that you were talking about this today! Ugh…My 6mth old DD has been going to sleep fine then waking about 40 – 1hr into her nap. SHe will cry for a second or two then just play or talk to herself. I dont know what to do. It happens at almost all of her naps and has been happening for a little over a 3weeks to a month. She still takes 3 naps. 1 in the morning about 2 hours, 1 in the afternooon abour 1 1/2 hours, and 1 in the evening for about 45 – 1 hour. Do you think that she may be dropping a nap? When she does drop a nap, will she drop the first one or the last one?HELP!!!! The next nap she will drop will be the third. See these posts for more on nap dropping:Dropping Naps: http://babywisemom.blogspot.com/2008/01/dropping-naps.htmlDropping a Nap: A Weaning Process: http://babywisemom.blogspot.com/2008/02/dropping-nap-weaning-process.htmlAnd these about the third:Dropping the 3rd Nap (evening): http://babywisemom.blogspot.com/2008/01/dropping-3rd-nap-evening.htmlIn Action: Dropping the Third Nap: http://babywisemom.blogspot.com/2008/02/in-action-dropping-3rd-nap.htmlShe is at an age where it is possible she will be ready to drop the third. It is usually around 6-8 months, though both of mine were older than that. I would be sure she isn’t waking for a different reason before dropping it. Good luck! Every night when I put my little guy (7 months old) down for bed. He plays in his crib for 30 minutes to an hour. He never really cries when I put him down for bed at night…just doesn’t go to sleep for quite a while. Any thoughts? Also, he does sleep well once he goes down. We put him in his crib at 7:30 (after he has his last bottle) and he goes to sleep around 8:00-8:30 and then wakes around 5:30-6:00. Thanx a lot for all of urs lovely blogs and answers. My baby now 15 weeks. now sleeping from 8:30 to 6 without any waking then again 6 to 9 or 8:30 . and she sleeps on her own by thumb sucking. problem is daytime naps. she hardly sleeps for 30 minutes and wakes up. mostly she wakes up happy . she is very active and wanna play all the time. she started to sleep on her own at night time i didnt do CIO for that.after feeding and sleep time she is v fussy. she used to sleep for about 1 hour. dont know what happened.i have read all ur articles on naps.i put in bed after 1 hour and dont hold her much. she now doesnt sleep in her swing.at night time she sleeps in her cot. her gums are not swollen. her breastfeeding time is now 10 minutes , b4 it was 15 minutes.Is it some kind of growth spurt?because she looks fine otherwise. she always moving her legs and wants me to play with her. what to do very desperate. I really need your help – my 7 1/2 mo twins were late starters with BW and took to it at 3mos like ducks to water.Now my girl is refusing to go to sleep for the afternoon nap – she spends the whole time rolling over and periodically crying in her crib rather than sleep. Her brother drops off just great. She will sleep if I swaddle her very tightly, but that’s not good for her and we stopped swaddling at around 5 1/2 mos.Help! Beth, there are a lot of possible reasons for this. 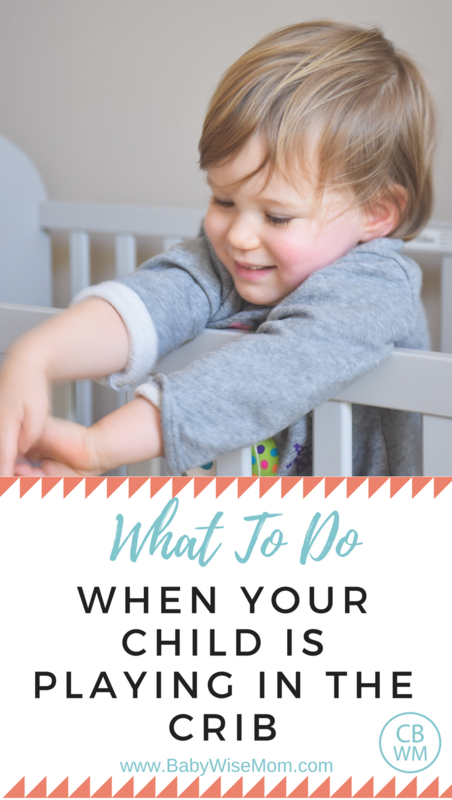 She might be practicing a new skill, she might need a longer waketime, she might be teething…I would look through the sleep problems posts, the naps posts, and the waketime posts for ideas in troubleshooting. I have a question about some things my almost 14 week old baby is doing. For a long time she started showing clear tired signs between 50-60 minutes. Stiff body, fussy, and if I missed that her eye brows get red and I need to put her down immediately. She has always gone down pretty easy–in the last several weeks she has got to the point where she gets her thumb in her mouth and is done with any fussing before I kiss her and leave the room. Lately, she has still gone down easy, does not fuss, but about 5-10 minutes later she starts talking to herself, pushing herself up (she is a tummy sleeper) and looking all around the room or looking at herself in the mirror, sometimes rolling from tummy to back (but she can’t get back over so I have to go flip her), or she just lays there wide awake sucking one thumb while checking out how cool her other hand is. She can scoot herself around the entire crib so if I lay her down facing one direction she often ends up facing the other direction. Sometimes in this process she gets her face stuck up against the side and I have to go move her. Me going in does not really disrupt her. 99% of the time I can go in there, help her get rearranged and leave without her fussing. Lately the tired signs, if they come at all, are not showing up until 75-90 minutes. But, with this time frame she “plays” as I mentioned above. So, all this to ask, does it seem like she is needing to extend waketime, or does she still need to be at about an hour and just is not really showing the signs any more? No matter what is going on I get her down by 90 minutes so she can sleep for 90 minutes, but if she “plays” she does not get that 90 minute nap. Other info:She is on a very good 3 hour eating schedule. She wakes up happy most of the time. Often she does not seem happy, but as soon as she is fed she is happy.By the way, congratulations on the pregnancy. I pray it goes well for you. KJackson, my guess would be a 2.5 month old still need a 4th nap, though perhaps it could be a 30-45 minute one (the 4th). Hi, thanks for the great blog, it’s so helpful!My 5 1/2 month old keeps waking at around 5am every morning. She is not hungry (she goes right through from 7-7) and just seems to want to chat – very loudly! – to herself, for ages. If I get up and put her dummy in she just goes straight back to sleep, but I have been doing this for several weeks now and she still wakes. What do you suggest? hi, just wondering if you saw my post? thanks! So my question is about Toddlers. My 18 mo DD has refused to nap the past couple of days. I know she needs it: Her eyes have dark circles under them and her top eyelids are swollen. Classic signs for needing more sleep. However, whenever I put her to bed (she’s in a toddler bed and has been for about 4 months now), she gets up and plays. I have tried going in there every 15 minutes to put her back down, but yesterday it took her 2 hours to sleep 30 minutes, and today is seeming to be on that same track. Also, because of the lack of sleep, we had a lot of discipline issues, and that seemed to effect her nighttime sleeping. She woke up at 2:30am crying and wouldn’t calm down until I picked her up and held her for 15 minutes. Any suggestions? Lindsey,18 months is a very typical age for all children (BW and non) to go through a “rebellious” stage. They really test limits and boundaries.If it were me, and it was available, I would move her back to the crib. She obviously is unable to handle that freedom right now. I would have her in the crib until she was obeying in the day.Check your freedoms in the day and be sure she doesn’t have too much. If it is the 18 month old phase, she should get back to obeying anywhere from a couple of days to a few weeks so long as you are consistent with discipline. Has anyone ever had their child wake up in the middle of the night and then talk in their crib for an extended period of time off and on? My daughter (13 months) did that last night and it was odd at first but now I am hoping it doesnt become a habit. She never cried, she started off whispering at first and then she went into a full blown “conversation” with herself off an on for about 45 minutes. About 4 days ago something similar happened, but she woke from her sleep laughing and laughed for a bit and then talked for a few minutes before going back to sleep. It was a total of maybe 5 minutes that night. Is this unusual? I did not go in her room either time, I just left her alone and she went to sleep on her own both times. Kaitlyn did that a few weeks ago. For her, it was connected to teething. If she is getting teeth in, it might interfere with her sleep. Hi Valerie~I need some advice here. My 11-month-old has started throwing his blanket and two stuffed animals out of the crib after I leave his room for naptime or bedtime. Then he cries until I go in and get them again. He will cry for a long time. For example, today for his 9:00 nap he cried for an hour. I went in, picked him up for a minute, put his stuff back in and he was quiet for about 45 minutes. I put him down for his 1:00 nap an hour ago and he has been crying off and on since. What do you recommend? I thought about trying a crib tent, but if you have any other advice let me know. He has also started to throw his toys out of his crib during playpen time. Today I had his brother put the toys back in, and that lasted a while until the timer went off. Thanks in advance for your help. I didn't run into this with my older two and I don't know what to do! my3sons,I think if you do go in and give it to him, I wouldn't pick him up. I would actually probably just leave them out since he seems to be doing it to get you back in there. Tell him if he throws them out, he won't have them. But for his age, a crib tent might be the way to go. For playpen time, I definitely wouldn't go back in and give him toys. That can be his first clue that throwing toys doesn't bring a visitor back. Then maybe he will translate that to nap time. You might need to shorten independent playtime for now until he learns to keep his toys with him. I completely agree. This works extremely well for my 15 month old, which isn't much of a surprise. In addition to laying her back down for her nap, I also check her diaper. I usually find that if I've had to lay her down two or three times, the she's got a dirty diaper. But this also works well for the 26 month old girl that I babysit once a week. She's not napping well with her other babysitter, but does extremely well at my house. Initially I just thought that at the very least, if she won't nap, she'll have quiet, restful play time in the pack and play, but she's successfully napped every time. 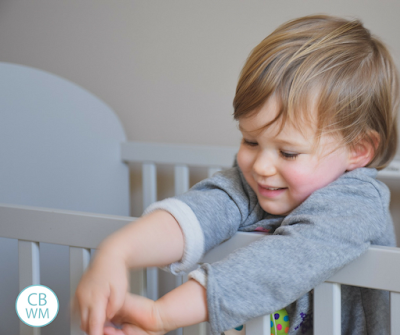 I like this post, but what should I do about a 7 month old playing in his crib. He doesn't understand me verbally telling him that it is bedtime. He will play for and hour+, sometimes not ever falling asleep. He has been a perfect baby wise baby up until two days ago. I need help. Cami,Something to know is that children do that periodically. In fact, as I write this McKenna has been playing in her bed for about thirty minutes. When Brayden was young, it really stressed me out, but now I know that it will all be okay. Exactly what you do depends on your child's personality. Some kids do best if you just let them be. Others do better if you tell them to go to sleep. It is good to see if you can think of a reason your child is not falling asleep. Was he overestimulated? Was he up too long? Is he teething? Is he simply working on a new skill? Some things you can help with, others are things to just wait out. Good luck! What is the limit to how many times I should go I and lay him back down? My 12 month old boy has played in his crib through every afternoon nap for over a week now. This morning, I went in seven times and he never did end up going off to sleep. He cries when I leave, but only for a short time, then is up playing again within minutes. This week has been very stressful for both of us because of this new habit. Amy, it really depends on the child. With one of mine, going in even once was not effective. With another one, going in once does the trick. Some might take several. I don't thinkI would go in more that 2-3 times. Then it turns into a fun visit session from mom. So my daughter is 19 mo old, won't go to sleep by herself bc I rock her. Naptime is a battle to start but she sleeps great once she's down (1130-130ish) and bedtime is a battle to get to sleep also (asleep between 830 and 930). She also wakes up most nights just once but takes 30-60 min to get her back down (with a 6oz bottle). I would like to teach her to fall asleep on her own in her crib for nap and bedtime. I would also like to move her nap to 1pm and bedtime to 730pm. I would also like to eliminate the nighttime bottle. My question is how to I go about all the changes?? Gradually, or one thing at a time?Thanks! Sorry–probably will be easier to get to do the other things. So start with her falling asleep on her own. When you try to change too much at once, you are working with too many variables and can't be sure what is working and what isn't. Thanks. So how far before I want her to be asleep should I put her in the crib to try and get herself to sleep? If she's normally asleep between 830/9 with us rocking to sleep, should I start at like 730 or 8, knowing it will take a while? Or could that be too early and she won't be sleepy enough? Also, should I try it for nap and bedtime, to be consistent, or just start with one of those? Do all naps and bedtime. Bedtime is usually in the 7 pm hour, so between 7-8. You want it to be about 12 hours before morning wake up time is. My 13 week old son is on a 3 hr schedule and can get himself to sleep usually without any crying. At night he sleeps from 8-630 with a dreamfeed around 10. He has 4 naps during the day and is doing 75-85 minutes waketime. We just increased his waketime from 70-80 minutes because he was playing in his crib for quite a while rather than falling asleep but it is still happening. He will sometimes play for 45 minutes before I go in and help him get to sleep. Does this signal that I need to increase waketime more? Could it be over or under stimulation? Any ideas are welcome. Thanks! Also, as I Am looking into a 3.5 hr schedule, do you sometimes suggest waking from the last nap of the day and doing waketime before feeding, then feed and go to bed? I noticed that in some sample schedules.